This fine ring by Navajo silversmith Rick Martinez has twisted square wire tracing the edge of the ring face. 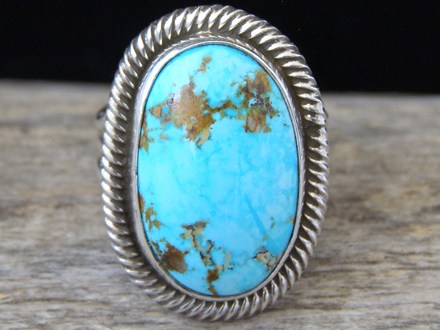 Rick set a pretty blue oval of natural, untreated Turquoise Mountain turquoise in the smooth bezel. The shank consists of three lengths of round wire which separate into a split shank before attaching to the ring back. Beautifully made, exquisitely comfortable and set with a fine natural stone of turquoise. Hallmarked R. Martinez and stamped NAVAJO and STERLING. Ring face: 1 1/8" x 13/16"